You know that little computer bar game “Spot the Differences” where players are shown two photos—side-by-side—that are identical except for a few differences. The objective is to find and identify the differences between the pictures before the timer runs out. 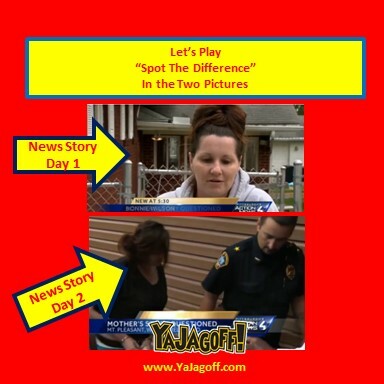 Well, our pictures aren’t quite identical but, they are of the same person, 2 weeks in a row, on WTAE-TV news. The difference in the pics? Day one she was telling the cops and reporters a story about how, when she went to the car wash, some guy came and took her money and put a gun to her 12-year old’s head, then ran away. Day two, she is being escorted into an arraignment for ALLEGEDLY making up the entire story. Day one, she was all, (sniffle, sniffle) this stuff was scary for me and my child kind of stuff. Day two, she’s yelling at the uniformed escorts to “open the %$# door” with her handcuffs and shackles on. Wait? What happened to meek little scared mom? How she got caught? The 12-year old daughter told the truth! Bonnie-bon-bon…what are ya thinking? Hey, we’ve all been driving and caught, by our kids in the car, yelling colorful words at other drivers. Aaaaand… we all know that, after that, you have to pull the car over and convince the kid that did not just happen OR that they need to never tell anyone that happened. The more experienced parents know that you must-likely need to bribe the kids with ice cream, a doughnut or even a toy or iPad, if it was an F-bomb that slipped! You can’t be this dumb! Jeezus.. I mean, you’re a heroin dealer (allegedly) for crissakes!! You’re no dummy! Every parent knows about the kid snack/toy bribe routine to keep them from telling the truth. Jeezus.. you not knowing snack/toy bribe routine is totally gonna embarrass the rest of us parents, Ya Jagoff!! The world’s a messed up place! Comcast Rated Worst – Whodda THUNK? Christmas Decorations.. Early or Late? Do We Need a Reading Class or a Driving Class?